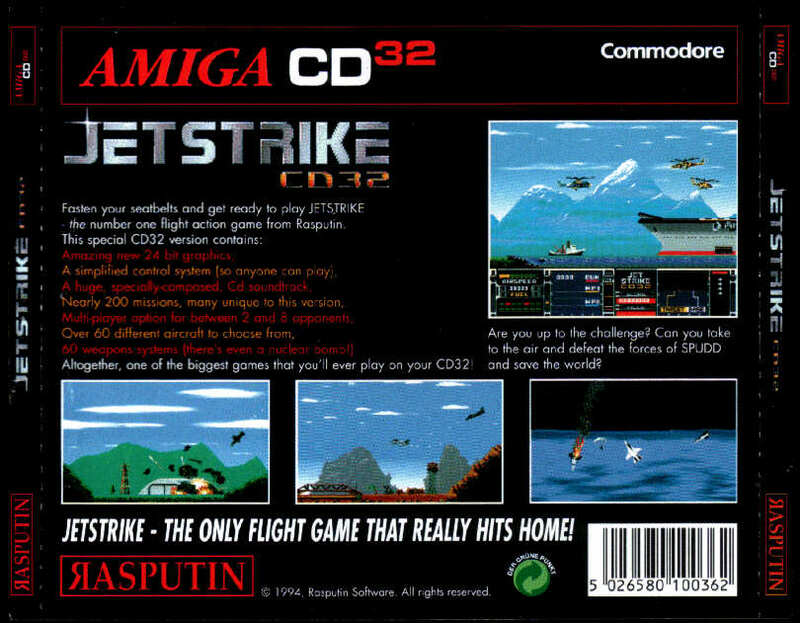 If one saw Jetstrike on display in some store, one could think "what an ugly game!". In fact Jetstrike isn´t beautifull game to look at, but, and as so many other "ugly" games, it plays like a beauty! Unknown for many, Jetstrike is 2D horizontal scroolling type game and there are two main game modes. On the Aerolympics, you can play by yourself, or by turns with up to 8 other players, and the object is to preform several stunts, like flying thru ballon gates, picking up secret agents, or aiming at some targets with rockets. The player is awarded points for completing the required mission and also for preforming adtional stunts, like loops. The other game mode is Combat. Here you have to complete several military type missions, taking aerial photos of Spudd bases, engaging on emotional dogfights with your trusty F16, bombing the enemy´s headquarters with a couple of 1000lbs bombs, or even picking up stranded agents on enemy soil with the effective Huey chopper. Each plane has individual control characteristics and engine sound, also a different weapon payload, for example you can´t load a 1930 Super Solution with a 1000lbs bomb, this feature, as many others, really show that the developers went thru some heavy research with this title. Each plane and weapon have a small description of their main features. 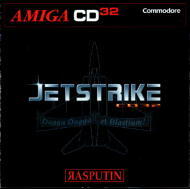 Jetstrike really has a life of it´s own, with it´s extensive list of avaible flying machines, including hang-gliders, WWII aeroplanes, like the Mitshubishi Zero, 30´s single engine aircrafts, and even the F117 Stealth bomber, and with the machines you can combine a wide variety of weapons, bombs, rockets, air-to-ground and air-to-air missiles, this game never gets boring. 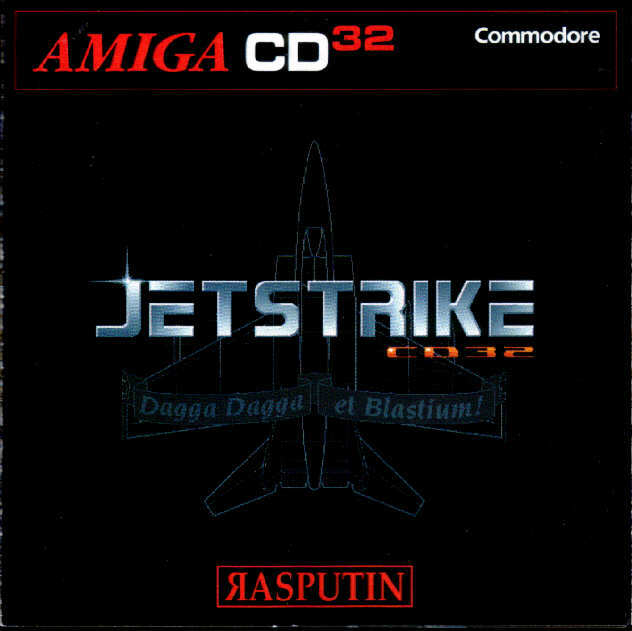 One other great feature of Jetstrike, and this one is a CD32 special, are the audio tracks. 14 tracks with music that ranges from a fast paced rock Top Gun style music, wich blends wonderfully with flying around on your Mig-24, to heroic like music, that is just right for that moment when you´re picking up that POW. The classic "Drop the Bomb" theme is for me, and for those that have played and know Jetstrike the flagship of this game and you´ll find yourself singing "Drop the Bomb" in no time. But of course not all are roses, and I could not end this review without pointing out some things that I feel are less good. First of all the scroll, it´s quite crappy, nothing to do with the type of 50Hz scroll that Amiga users got used to. I don´t know if the PC version derived form the Amiga one, or if it was the otherway around, but it sure feels that the conversion from PC to Amiga could´ve been better executed. One other thing that can get to be very annoying is the jet roar every time you select an option. The graphics could be better, but the playability is so wonderfull you forget the ugly 64 color graphics. All things considered Jetstrike is a great game and you´ll spend hours with it. I would like to post a request for all you game developers out there, or even for the guys at Shadow Software (if you ever read this). 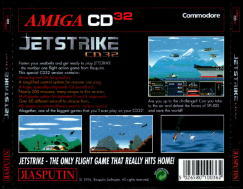 I would like to see a new version of Jetstrike, no need for fancy 3D graphics, nothing of that. Simple just like Jetstrike, but with a 2 player mode, split screen or something, and a multiplayer mode, over the internet, i think that would be great!